For many it is a fulfilling experience that can come with small triumphs as you help them thrive. You may find yourself growing closer to this person than you ever have before, sharing intimate moments as you help them do things they used to do on their own. At the same time, caregiving can be extremely strenuous — not because your loved one is a burden, but because of all that goes into navigating someone else’s health, including supporting them as they struggle emotionally to cope with their new way of life. Adding in dealing with doctors, red tape, insurance, all while trying to focus on your loved one’s well-being, is hard. And it doesn’t leave much time for you to take care of yourself. The new year is a time of reflections and resolutions so this year, why not make self-care a priority? Looking out for yourself may feel selfish — and it is, in a good way. Doing small things for yourself will make you a better caregiver for your loved one. Cross one thing off your never-ending to-do list. Between being a caregiver, home, job, family responsibilities and planning for the future, it may seem like your to-do list goes on forever. Prioritize what absolutely must get done but make a possibly tough decision and decide not to do one thing. Learning how to give yourself a break in this sense can truly make a difference in a day. As one Mighty contributor wrote, “learning to ask for help makes you strong, not weak.” Asking for help may make you feel like you can’t handle it, that you’re “less-than” or that your loved one could be getting better care from someone else. But this isn’t true. Asking for help actually makes you a better caregiver — you’re acknowledging what you and your loved one need most and you’re finding a way to get it done without putting it all on you. Many friends or family are very eager to step in and help you but simply don’t understand the best way to do this. When they say, “Let me know how I can help…” you may be tempted to act like you’re all set on your own but try answering them with something concrete. “Actually, I could use some help getting this laundry done,” or “You know, if someone could sit with her for an hour, it would give me time to recharge.” You may be surprised who is willing to step up for you. Remind yourself you have a voice — and no one is allowed to silence it. Being a caregiver often means also being your loved one’s #1 advocate. This means you may be fighting for diagnoses, management solutions, to have your voice heard at all — and that can be really tiring. However, chances are you’ve done a lot of research — and no one knows your loved one better than you. Take time each day to remind yourself of this, and if you don’t get the type of support you need for your loved one the first time, keep trying until you are satisfied. Sometimes, this can make all the difference. All of this is of course tiring, but a daily boost of confidence in your own voice can be helpful on your caregiving journey. Be open about your situation. The new year can be a time when we are filled with optimism about the year ahead, but it comes with its fair share of stress too as caregivers continue to navigate the health challenges faced by their loved one, solo. 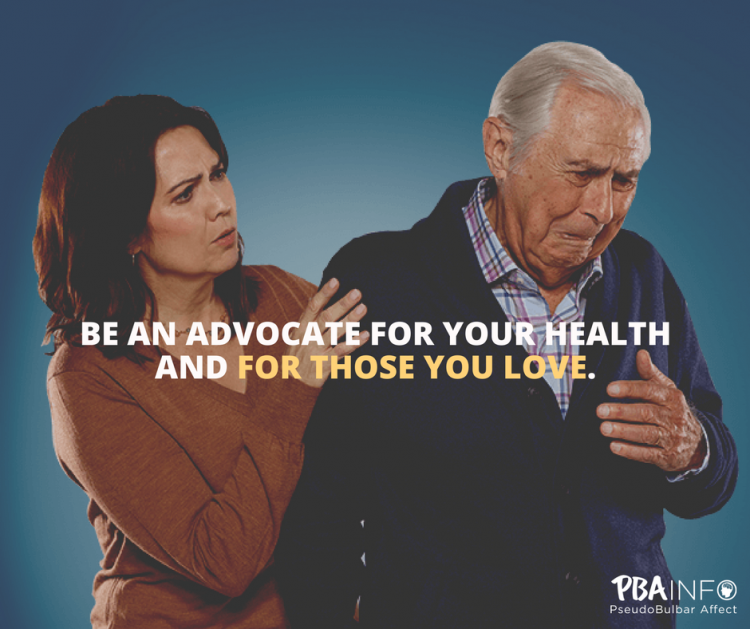 For example, a person with PBA may cry when they don’t feel sad or when they only feel a little bit sad, or laugh when they don’t feel amused or when they only feel a little bit amused. Being transparent with your family about your loved one’s condition may help people be more understanding, alleviate confusion and offer an opportunity for family to step in and help. In the case of Jim and Lori, since he was diagnosed with PBA, Jim and Lori openly discuss his condition with their kids, friends and family, so they’re prepared if he has an episode in their presence. Learn not to punish yourself when you have a bad day. On these days, it’s important to remember that these thoughts are normal, and you’re allowed to have them. The trick is acknowledging the feelings — they may be a sign you need a break. Then, you need to learn not to be so hard on yourself. One of the best things you can do here is take note of your feelings, validate them, and then do something about it. Try to go a bit easier on yourself each day. You’re doing the best you can and it is important to recognize that this new year. Your life may feel overwhelming, hard and unfair. All of those feelings are valid. You may feel too old to be “silly” or think it’s ridiculous to purposefully try to be silly but hear us out. Laughing, smiling and being silly can be amazing for your health. So, how do you practice silliness? It may feel uncomfortable at first, but try it out — go into a room alone, and dance like a fool. Wiggle your limbs, make “weird” noises. Sing a song you love. Make funny faces at yourself in the mirror. If all of these seems too much, just practice smiling even when you don’t feel like it. Studies show smiling can actually “trick” your brain into happiness. So, take 5 minutes and just be silly.